Chinese and US companies signed deals worth more than US$250 billion on the second day of US President Donald Trump's state visit to China. 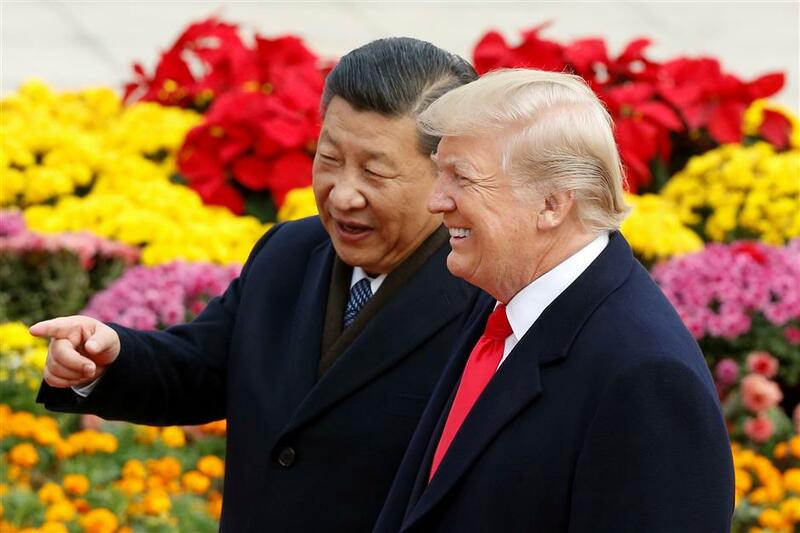 Chinese President Xi Jinping points out something to US President Donald Trump during a welcoming ceremony in Beijing yesterday. Chinese and US companies signed deals worth more than US$250 billion on the second day of US President Donald Trump’s state visit to China. Chinese President Xi Jinping revealed the figure yesterday, which is on top of the US$9 billion in agreements signed on Wednesday. The contracts signed yesterday included the Chinese purchase of Boeing jets for US$37 billion, mobile phone chipsets from Qualcomm for US$12 billion, US$1.6 billion of soybeans and vehicles and parts from General Motors and Ford for a total of US$11.7 billion. Other agreements included memoranda of understanding on liquefied natural gas sales and industrial development cooperation. One of the most substantive agreements was a gas deal between the state of Alaska, Alaska Gasline Development Corp, China Petrochemical Corp (Sinopec), China Investment Corp and the Bank of China, involving a total investment of up to US$43 billion. Officials said the joint development agreement will create up to 12,000 American jobs and reduce the trade deficit between the US and Asia by US$10 billion a year. Contracts signed on Wednesday included a commitment by China’s major online retailer JD.com to buy US$1.2 billion of American beef and pork. As the world’s biggest developing economy and developed economy, China and the US are highly complementary rather than competitive, Xi said when meeting business delegates from both countries. “We are willing to expand imports of energy and farm produce from the United States, deepen service trade cooperation. We hope the US side will increase exports of civil technology products to China. We will continue to encourage Chinese companies to invest in the United States. We also welcome US companies and financial institutions to participate in the Belt and Road initiative,” he said. Given the rapid growth of bilateral trade, friction is unavoidable, Xi said. The two sides should uphold the principles of equality and mutual benefit, mutual understanding and accommodation, and handle disputes through dialogue and consultation, he added. Xi reaffirmed China’s commitment to opening-up and reform and said China will not close its door to the world. It will only become more and more open. Overseas-invested companies, including US-invested firms, will enjoy a more open, transparent and standard market environment in China, he said. Xi said China’s economic outlook will look bright for a long time to come. The Chinese economy has been transitioning from a phase of rapid growth to a stage of high-quality development with an improving economic structure. It has the foundation, condition and impetus to sustain good momentum, he said. China is the US’ largest trading partner while the US is China’s second-largest. Bilateral trade surged to US$519.6 billion in 2016 from US$2.5 billion in 1979, when the two countries established diplomatic ties. Over the past decade, US exports to China rose 11 percent a year on average, while China’s exports to the US were up just 6.6 percent. China holds a surplus in goods trade with the US while the US maintains a service trade surplus with China. Jobs created by Chinese-invested firms across America had jumped ninefold since 2009 to 140,000 last year, according to a report by the National Committee on US-China Relations and Rhodium Group.